We’ve said 2009 was really bad countless times. But now that the law-firm related numbers are coming out, there’s concrete evidence — even pictures — that things were worth crying over.Hildebrant Baker Robbins and Citi Private Bank released their 2010 Client advisory summary. 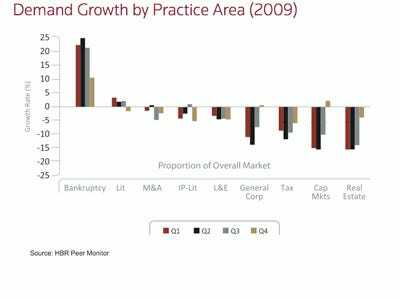 The American Lawyer summarized the findings, which called 2009 the “worst year for the legal market in at least the half past century” and noted that AmLaw 100 firms took the biggest hits and also made the biggest attorney and staff cuts while AmLaw 200 and mid-size firms suffered a little less. The ABA Journal (which links to a PDF version of the full report) pointed to the fact that law firms partner ranks grew faster than their associate numbers prior to the downturn, which will mean “tough love” partner conversations have happened and will happen even more in 2010. We think, however, that the chart pictured summarizes the abysmal last year of the decade better than anything we’ve seen. The only group that saw any real growth was bankruptcy. Even litigation, which usually shoots up when economic health turns downward, only saw modest gains. And everything else? We’ll just say 2009 was about as “negative” as it could be.